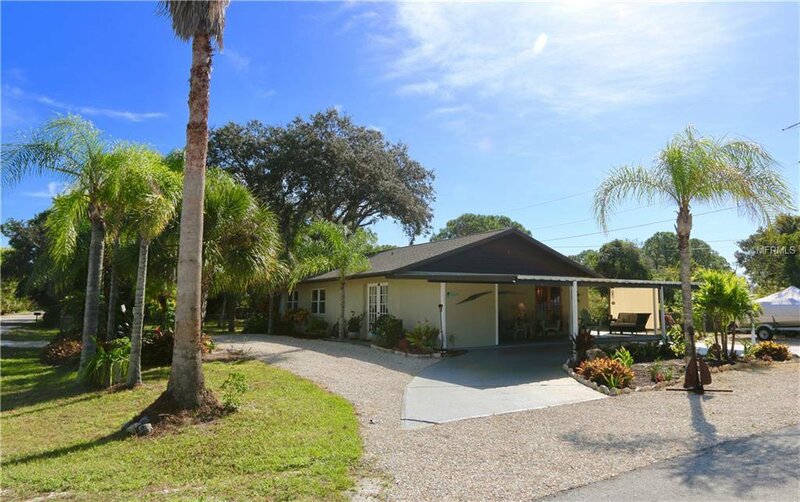 A PRIVATE OASIS AWAITS YOU....This stunning 3 bedroom 2 bath home with a charming detached cottage/studio is tucked away in a quiet neighborhood that overlooks CHARLOTTE HARBOR STATE PRESERVE. With 0.35 acres...privacy abounds! Plenty of room for an RV, boat and other toys. Gather on your large front porch and sip your favorite refreshments with friends and family. Renovated kitchen with wood cabinets, granite, pullouts and a large rolling island. For all the wine enthusiasts, a CUSTOM WINE CLOSET with space to store 80 bottles of wine! The spacious master en-suite has french doors opening out to a tropical backyard and dipping pool. Bathrooms have been renovated with new plumbing, granite vanities, fixtures and custom tile. Updates include New AC 2018, plumbing, electrical including PANEL, NEW POOL PUMP, WATER SOFTENER and WATER HEATER. Just steps from the main house you have an adorable detached 385 sqft STUDIO/COTTAGE. Custom painted floors, insulated walls and ceiling, make this the perfect spot to cozy up for date night to watch your favorite movie or relax with a good book. French doors on both sides of the cottage open up to large oaks, pines and palms. Step out to the pergola deck to enjoy your favorite football game, family gathering or party. Conveniently located to the Leverocks water taxi to Rum Bay, the Palm Island Ferry, Don Pedro Island kayak launch and many other points of interest. THIS BEAUTIFUL OASIS IS A MUST SEE TO EXPERIENCE IT'S CHARM AND LOCATION. Listing courtesy of GULF ACCESS HOMES INC. Selling Office: PARADISE EXCLUSIVE INC.